I’ve read with interest the several posts on Hallowe’en, and Happy Hallowe’en to everyone who is participating in any way. Here in Australia, Hallowe’en is not big. In my regional New South Wales town, one supermarket chain offers huge Jack o’Lantern pumpkins with instructions how to carve. A few other retailers display costumes and assorted Hallowe’en bits and pieces; however, early on the morning of Saturday 29th, the newsagent/gift shop in the main shopping centre reduced its dozen or so Hallowee’en items by 40%. Several years ago, I was lucky enough to experience an American Hallowe’en while staying with friends in Pensacola. Pride of place in their house front window was a carved pumpkin; rooms were festooned with assorted orange and black decorations, and we ate, among other appropriate foodstuffs, home-made orange cupcakes with black icing. In the evening, we joined a Haunted House walking tour of the historic district, where we heard tales of the houses’ pasts and the ghosts who were (are?) supposed to revisit these, their homes, on Hallowe’en. Such a fascinating and spooky brief encounter with some of the heritage of the area. Just the other day, I was asked where I got the idea from for my recent release Where the Heart Is, especially since the setting for most of this contemporary romance is in the Eastern Caribbean, geographically distant and not easy to reach from Australia. A newspaper ad caught my writer’s attention, not because I was interested in the product (which was not for a drink or for travel), but because it featured two tall glasses of an amber liquid garnished with slices of lime and paper umbrellas on swizzle sticks. The background showed a wooden jetty extending into a turquoise sea. Cutting the ad out, I saved it. Some time later, browsing through my ideas folder, the ad “told” me this was the location for a story set in the Caribbean. I have no idea why, as it could easily have been in Australia. The amber liquid became a mango daiquiri, while the jetty was needed for the fictitious amphibian plane that serviced a fictitious island. So much research to do! I had a fabulous holiday. I visited Barbados, scribbling bits of the story while waiting for a flight to St Vincent, from where I took the ferry through the Grenadine islands. Champagne island in the story is a composite of what I experienced; the characters and plot are entirely imagination. Back to Hallowe’en—over to you in the northern hemisphere. Have fun! Love, Priscilla. We all know about black cats and their associations with “witches” and bad luck if one happens to cross your path. But what about black dogs? As a dog person who’s shared my life with a number of black dogs, I was interested to discover their otherworldly history. And as it’s nearly Halloween, what’s more appropriate than a short history of scary things. After all, I write historical fiction and research is probably the most fun part of the process, and this was no exception. 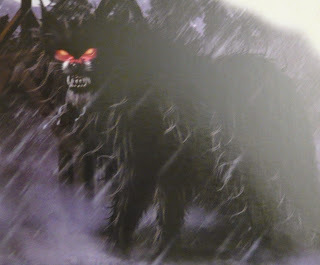 Since ancient Greek mythology’s Cerberus and especially in old Celtic and Germanic legends, in the British Isles and Western Europe, the black dog has been associated with demons or hellhounds. They’re generally large nocturnal animals with huge claws; black, mangy fur; “nasty, big pointy teeth” (to quote Monty Python…OK that was a rabbit); and red or green glowing eyes. Sometimes he will appear from the shadows of night and at other times a bolt of lightning presages his appearance. He is often associated with crossroads and places of execution. His presence almost always portends death for whomever is unfortunate enough to see him. He’s been known by various names, such as Barghest of Yorkshire and Black Shuck of East Anglia, and Moddey Dhoo from the Isle of Man. In Spain, Dip is an evil, black, hairy vampire dog. Cadejo from Central America and Southern Mexico can be white (benevolent) or black (malevolent), and appears at night either to aid or to kill travelers. 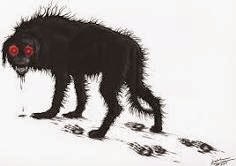 In the U.S. we have our own black dog legends, one right here in Connecticut close to where I live, is called the Black Dog of Hanging Hills. In literature, perhaps the most famous devil dog (not to be confused with the yummy Drake's confection) is Sir Arthur Conan Doyle’s Hound of the Baskervilles. J.K. Rowling’s young sorcerer crosses paths with a black dog in Harry Potter and the Prisoner of Azkaban. Even Bram Stoker’s Dracula transforms into a black dog at one point. Although I haven’t included many dogs in my books, a couple of street curs (one of which is black) makes a cameo appearance in my fantasy, The Return of Tachlanad. And for a fun exercise while in rewrites for book 3 of “The Serpent’s Tooth” trilogy, I made a point to include a few Wizard Oz references in The Partisan’s Wife. One such was naming an inn where Anne and Peter spend a night en route from Albany to New York. I called it The Little Black Dog (homage to Toto). Had I known then what I know now about the nature of black dogs in history, I might thought twice. Shadow, my first black dog was a young stray mutt who hung out at the Amoco gas station my father frequented. I met him in 1956 on Christmas Eve (not Halloween) when I accompanied my dad to have my mother’s tires changed over in preparation for winter driving. I went up in the car on the lift with the little dog while the work was being done, and we instantly became best buds. To my great joy, Frank, the gas station owner allowed us to take him home. Knowing my mom would disapprove of such a smelly, greasy animal, we had to sneak Shadow into the house. But after a bath, during which I was nearly certain he’d turn white, he became a part of the family for the next 15 years. There was nothing evil or malevolent about my childhood companion, although I did go through a time when I swore he was actually a prince under a witch's spell…and all I had to do was kiss him. Kathy Fischer Brown is a BWL author of historical novels, Winter Fire, Lord Esterleigh's Daughter, Courting the Devil, The Partisan's Wife. The Return of Tachlanad, an epic fantasy adventure for young adult and adult readers is her latest release. Check out her The Books We Love Author page or visit her website. All of Kathy’s books are available in e-book and in paperback from Amazon.